But Vaadin was still evolving towards an even better framework. I’ll summarize the new fancy features. Last week I went to a very interesting talk about Android. THe programming language isn’t Java but is very similar to Java. Creating fancy applications seems still a bit difficult but one can only develop webapps of course. 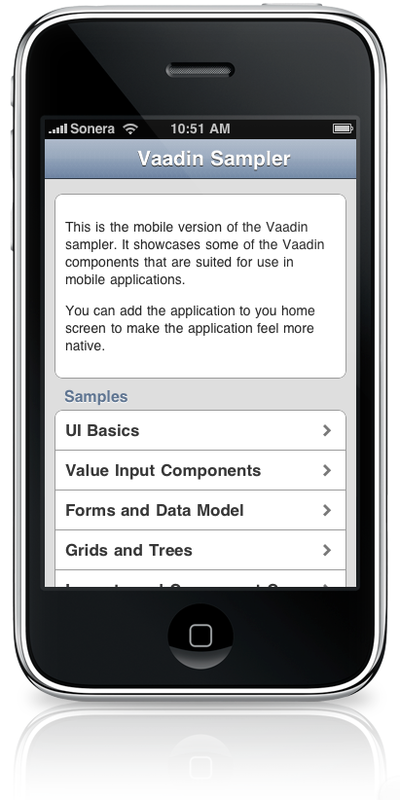 Vaadin also has a framework to develop smartphone applications (webapps) called Touchkit. A lot of people don’t know that you can develop applications for smartphones with Vaadin TouchKit . These applications have an iPhone look and feel but will run on iPhone, iPad and Android. TouchKit is optimized to run on smartphones so it’s optimized for low low performance and low memory (ROM) devices. The add-on directory that was released this year is a marketplace where themes, UI components, tools, data components and miscellaneous add-ons are distributed to the community. Most of them are free, for some of them you’ll need to have a license. It’s a very good initiative, no need to write a fancy component because there’s a big chance you’ll find it in the add-on directory. Most of the add-ons have a demo site, source code, project homepage, issue tracker and forum attached. But there was 1 shortcoming: maven integration. Most Java projects are based on Maven, Spring and Hibernate and Vaadin supported all of these. But if you wanted to use an add-on in your project, you had to download the jar and add it to the classpath. Since I use Maven I do not longer like the idea of commiting jar’s in Subversion. So I added a script to SVN which contained the code to install the add-on jar in the local repository. Next I installed it on Nexus and added the dependency to the pom.xml. But times change and the guys from Vaadin really listen to the community. They know very well that a framework on itself isn’t good enough. Integration with other common used frameworks is a must these days. So the guys set up a Maven repository, add all existing add-ons to it and all newly added add-ons will be automatically added to that repo. More info about the add-on maven support can be found here. The code that must be added to the pom.xml file is also available on the add-on directory site. Easy huh? Another more detailed talk about Vaadin will be the success-story of the conversion of Black Belt Factory (aka Java Black Belt) to Vaadin. It’s scheduled on 30/03/2011 in Brussels and is organised by the Brussels Java User Group (BruJUG). The talk will take 3h and will be presented by the CEO of Black Belt Factory . I will attend the talk, and you? TouchKit does not work on my Evo 4G (Froyo). It is fast yet there is no scrolling. So you know what, I am getting sick of all these frameworks that support only the effeminate iPhone. I am waiting for jQuery mobile and will make sure I will never consider anything else again.